Caroline Aked, Steve Alguire, Alyssa Clark, Lesley Dowey, Victoria Goring, John Healy, Daniel Levesque, Derek Murchie, Darlene Spencer, Alan Rosenthal. You're running for your life. There's nowhere to run to, but plenty to run from. What would you sacrifice to survive? Your child? Your love? Your last shred of dignity? What can save you from yourself? Run...and find out. A lovely garden party is shattered by terrorists. Terrorists with a twist; for the guests must run. As the guests are forced to test their physical boundaries, they begin to discover just what it is each are running from. Some guests are able to confront their inner demons, while those who continue to run, albeit metaphorically, find an unpleasant fate. A psychological drama, Run satirizes complacent society life, questioning our values and integrity. 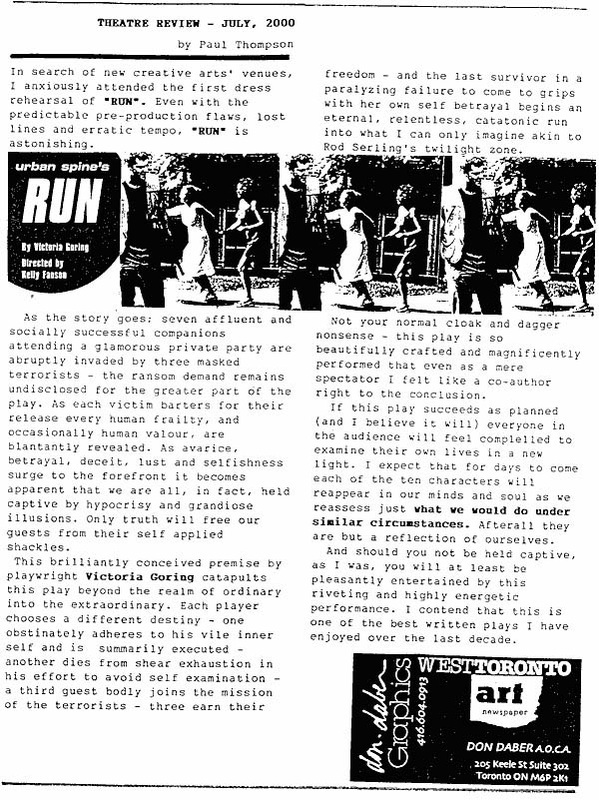 *Run has been adapted into a screenplay.